Situated around 60 kilometers away from Zhangye, Pingshan Grand Canyon is the nearest comprehensive scenic area to the city in China. It features natural wonders, canyon exploration, and geological research. At Pingshan Grand Canyon, most of the rocks in circular cone or column are red. From the bottom to the top of the canyon, there are different rock formations from the Cambrian to the Cenozoic. The layers are clear, the colors are different, and the rocks contain representative biological fossils of various geological ages. You can climb up to the top of the canyon via the ladder to explore the one-of-a-kind views of the Thin Strip of Sky. It is not suggested that the big tourists explore the Thin Strip of Sky. There are several viewpoints at the canyon for tourists to appreciate the stunning landscape. Some places at the canyon are very narrow and others look dangerous. At the canyon, you will find Qinghai spruce, Qilian cypress, and aspen with more than 80 species of wild animals and birds at the forest. If you are lucky enough, you may encounter Gansu red deer, blue sheep, Himalayan Snowcock, Gazella subgutturosa, argali, etc. The best time to visit Pingshan Grand Canyon is in the morning during the opening hours as it always takes 3 hours at least to explore the canyon. 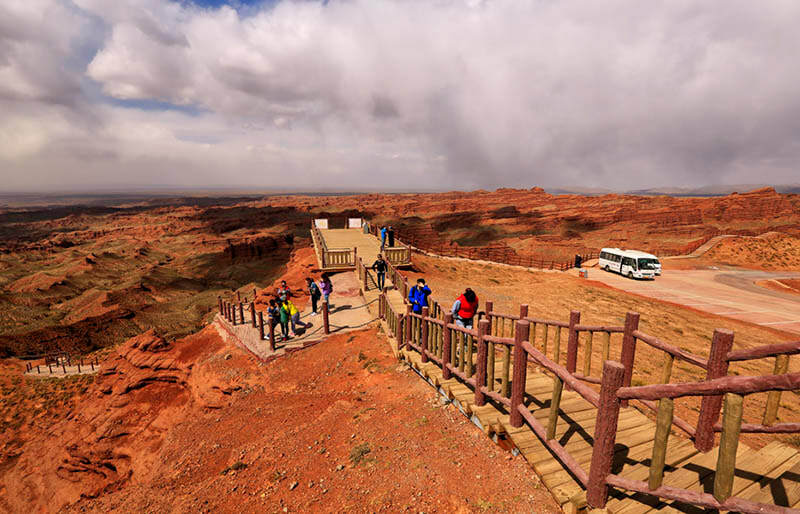 There is only one direct bus from Zhangye to Pingshan Grand Canyon. Therefore, there are only a few options. Rent a vehicle to the canyon from Zhangye. This is the quickest and most direct option. Take the commuter bus in front of Zhangye Power Building (张掖电力大厦). The bus runs at 08:30 and 14:30. As at 6th December 2018, the entrance pricing to the canyon (including the entrance and the shuttle bus) is 130 CNY per person, including children at all ages and the elder at all ages. For the latest pricing information, please contact us via email (info@wendyweitours.com). It is not suggested that those who are suffering from heart disease, high blood pressure and mental disorder explore the canyon. Please do not run fast at the canyon due to the high altitude. Interested in visiting the Pingshan Grand Canyon on a Tour? Wendy Wei Tours offers a variety of different packaged tours as well as custom tours including the Pingshan Grand Canyon, among other attractions and destinations. To find out more, please visit our Tours page or Contact Us directly to find out more.